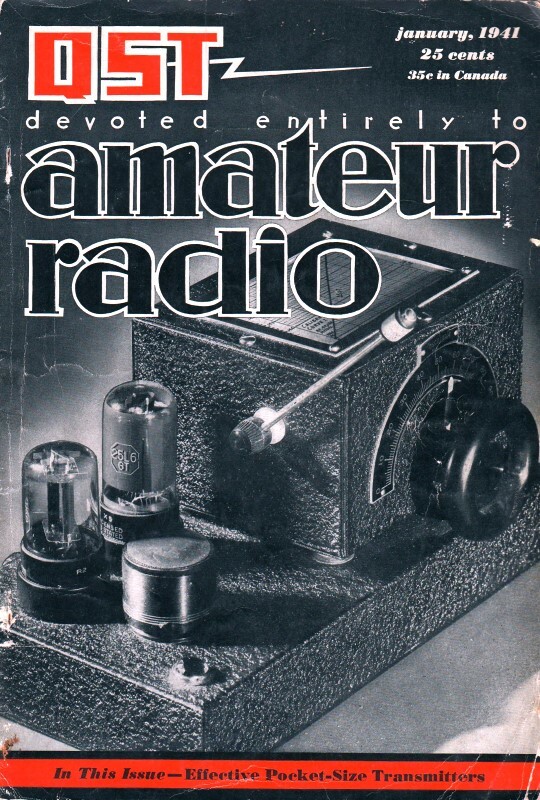 Wien bridge oscillators had been around for a few years prior to this article in the January 1941 issue of QST magazine, but evidently they had not been applied widely to amateur radio applications. In fact, Hewlett-Packard's very first product, the Model 200A audio oscillator, employed a Wien bridge oscillator as its frequency determining circuit. U.S. patent 2268872 provides a detailed description of its operation as well as the basic schematic. It was considered breakthrough design because its amplitude and frequency stability rivaled that of the beat frequency oscillators of the day - at a small fraction of the cost, size, and weight. The Model 200A quickly became a staple instrument on the benches of designers and launched HP into the Keysight Technologies it is today (I'll forever wish HP had kept their name for the Test & Measurement division and called their computers something else). The Hetrofil first appeared in "Hetrofil - An Aid to Selectivity" in the September 1939 QST. Fig. 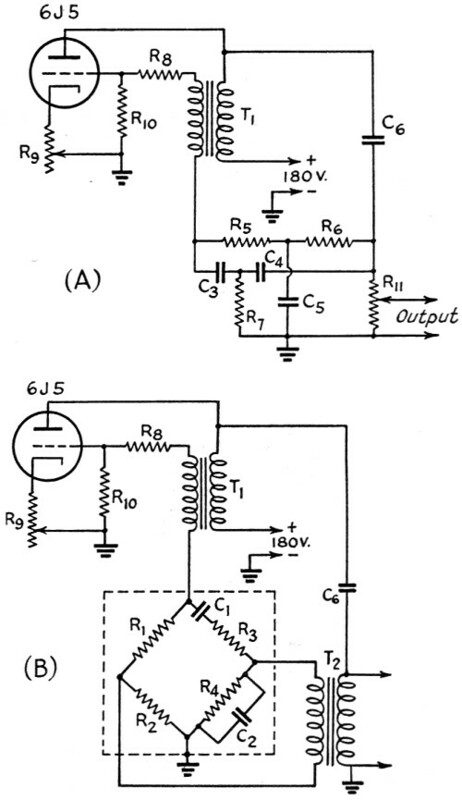 1 - The fundamental Wien bridge circuit. 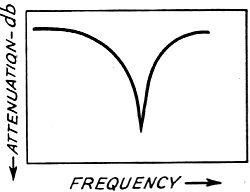 Frequencies for which the bridge is balanced do not appear in the output circuit. Fig. 2 - A typical selectivity characteristic of the Wien bridge. 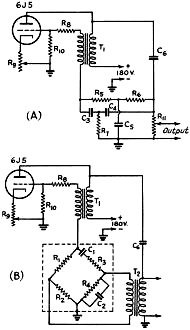 This characteristic is basic in audio oscillators using the circuit. Fig. 3 - The equivalent parallel-T network, for use with grounded input and output circuits. Fig. 4 - Simple bridge audio oscillator circuits. A - using the parallel-T network; B - using the bridge. C3, C4 - 0.15 μfd. C6 - 0.1 μfd. or larger. R3, R4 - 10,000-ohm potentiometers. R5, R6 - 10,000 ohms. 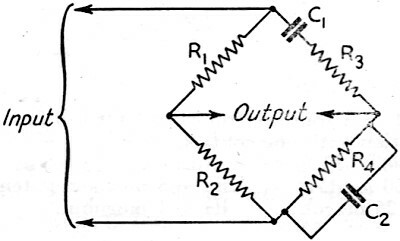 T1 - 3:1 audio transformer. The above listed values are merely examples. Any resistors and condensers that satisfy the equations may he used. The Wien bridge is quite an old timer in the communication game, but it has remained in the laboratory until recently. During the last year, however, there have been several commercial applications, although the "Hetrofil"1 is so far the only amateur device using the principle. The fundamental circuit, shown in Fig. 1, is quite simple, and with some modifications can be applied to such uses as heterodyne reduction, oscillator frequency selection, sound analyzing, frequency measurement, capacity measurement, and condenser power-factor measurement. Our present concern is with its application in simple audio oscillator circuits, of the type suitable for speech amplifier testing and similar uses about the ham shack. Without going into the operation of the bridge, already covered in Dr. Woodward's article.1 we may say that it is a selective network with a sharp selectivity characteristic, Fig. 2 being typical. Audio oscillators using the Wien bridge or its equivalent parallel-T network as a selective feed-back network have recently been introduced commercially.3 Essentially such an oscillator is an amplifier with both positive and negative feed-back. The positive feed-back occurs at all frequencies while the degenerative feed-back just cancels the positive feed-back at all frequencies except the frequency for which the network is tuned. By varying this null point, the frequency of oscillation is varied. An audio oscillator using the Wien bridge or its equivalent-T for the degenerative feed-back has many advantages over the conventional heterodyne and LC audio oscillators. The heterodyne oscillator is a complicated affair with many tubes and circuits; while the LC oscillator requires an iron-core coil and large condensers to tune to audio frequencies, with the result that the frequency is usually varied in steps rather than continuously. The Wien bridge oscillator can be made quite simply, requiring only one tube, and can be tuned continuously by resistances; in addition, it gives practically harmonic-free output because of the sharp characteristic curve of the degenerative network. Fig. 4-A is a simplified oscillator of this type, using the parallel-T network. 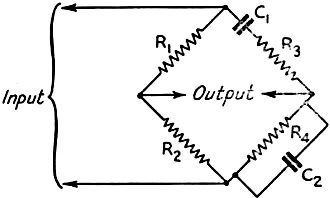 The Wien bridge and a transformer are used as the selective network in the oscillator shown in Fig. 4-B. A Hetrofil can be used as the bridge in the latter circuit. In both circuits the positive feed-back is obtained through the 1:3 transformer, T1, with the low-impedance side in the grid circuit. The amount of regeneration is controlled by the cathode resistor, R9. A by-pass condenser across R9 is apt to cause the oscillator to produce all sorts of gurgling sounds, and therefore should not be used. The oscillator can be tuned by either of the methods previously described. If the feed-back is too great a resistor, R8, of the order of 500 ohms, will have to be put in series with the grid lead. The circuit of Fig. 4-A has the advantage of requiring only one cheap transformer, but has the disadvantage that a three-gang resistor that stays ganged is needed. Condenser tuning might be used instead, or a number of feed-back circuits could be switched in or out for different fixed frequencies. The circuit of Fig. 4-B has the advantage of being easily tuned by a two-gang resistor, but has the disadvantage of requiring two transformers. It would be possible to obtain the 180-degree phase shift necessary for degeneration by using a voltage from the plate circuit of the second section of a double-triode tube. This would make possible the elimination of a transformer, thereby cutting cost and reducing size. However, in this connection it must be pointed out that the two feed-back voltages applied to the grid must be exactly 180 degrees out of phase. This condition is hard to fulfill when more than one tube is used. In Fig. 4-A, the resistance of the potentiometer across the output should be high so that the degenerative voltage is unaffected. The resistors in the degenerative network should be fairly high in value so that a substantial degenerative voltage can be developed at low current. The cathode-resistor control should be advanced only far enough to set up reliable oscillation. The plate-supply voltage can be varied from about 150 volts to about 450 volts without causing a noticeable shift in oscillator frequency. At medium and low output, the harmonic distortion is so small as to be negligible. However, at high output a small second harmonic is discernible. The output volume is too great for comfort when using a headset, but if greater volume is needed for loud-speaker operation it would be advisable to add an amplifier rather than to try to get more output directly from the oscillator. This will keep the harmonic content to a minimum. * Engineer, James Millen Mfg. Co., Inc., Malden, Mass. 1 R. W. Woodward - "Hetrofil- An Aid to Selectivity," QST, September, 1939. 2 W. N. Tuttle - "Bridged-T and Parallel-T Null Circuits for Measurements at Radio Frequencies," Proc. I.R.E., January, 1940. 3 H. H. Scott -"A New Type of Selective Network and Some Applications," Proc. I.R.E., February, 1938.